This is the best time of the year for simple and rustic cakes. After a walk on a cold and foggy November afternoon, with a fresh hot coffee it will enliven your soul and body. 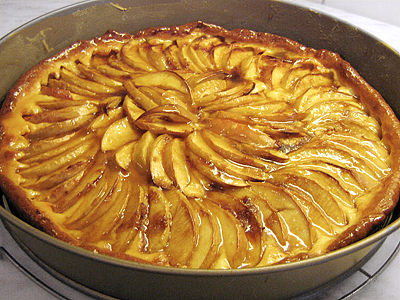 The base of this apple tarte is not made with the traditional yeast dough but with this fast and easy quark oil dough. Preheat the oven to 180°C (= 356°F) . Slightly grease and flour the baking tin. 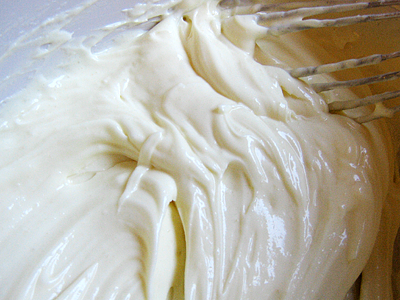 Prepare the quark oil dough and line the tin with it. Slightly prick it with a fork. Just whisk these three things together and put the cream into the pan on top of the dough spreading it evenly across the bottom. * In Germany this is old fashioned 'Vanille-Puddingpulver zum Kochen'. It is important to use one that needs to be cooked. One package is about 38 g (= 1.34 oz) and sufficient for ½ litre milk. But don't use the milk here! There is no need for this vanilla quark layer but it is a nice addition and really done in a few seconds. Wash and core the apples, cut them into wedges. You don't need to peel them – it's a rustic tarte. But if you have no teeth or if the peel is very firm, of course you may do so. Put it into the oven for around 40 minutes until it's crisp and golden brown. 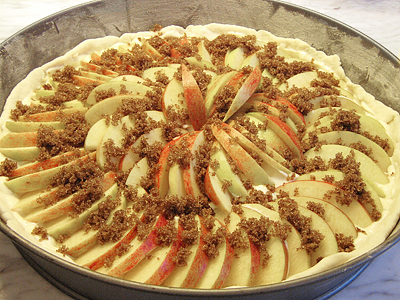 If you'd like it being glazed with abricotage, do this immediately after you get it out of the oven. Instead you can leave it to cool and dust it with powdered sugar. Eaten still warm with a dollop of vanilla or caramel ice cream would be heaven!